Trying to beat the heat and eat someplace fun. Wanting to try a new place. 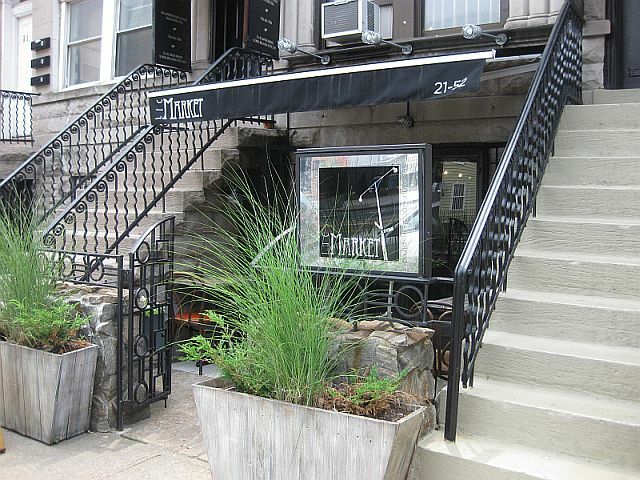 Fork and Spoon decided to try LIC Market – now celebrating their 1st anniversary. We had heard wonderful things about LIC Market and decided to begin our exploration of Long Island City with LIC Market. It is very difficult to park here, so plan on driving around for a bit. As you walk into LIC Market, you are in the retail area of the business. They sell teas and pickles and jams. They also sell coffee and tea to go. After you walk through this space there is a dining room in back. A very small dining room. So crammed full of tables that diners actually have to get up so you can sit down. The lunch menu is small, but the most of what is on there is enticing! Before we start on the food, let’s get the iced tea situation out of the way. The iced tea comes in a large glass, probably 16 ozs. There is maybe – a big maybe – 4 ozs of tea and the rest ice. Now this wouldn’t be bad if the iced were bottomless. It’s not. It’s $2.50 per glass. I don’t know about you, but I resent paying $2.50 for 4 ozs of iced tea and a glass of ice – FOUR TIMES. 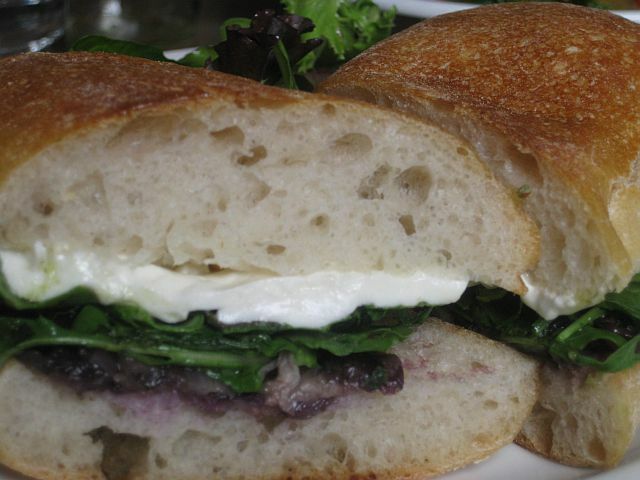 Our first sandwich was fresh mozzarella, grilled radicchio, arugula and basil on French bread. This was very good. Fresh Mozzarella was slightly salty. The bitterness of the grilled radicchio was nice with the peppery arugula. It could have used another – something – vinegar, oil, just another layer of flavor. 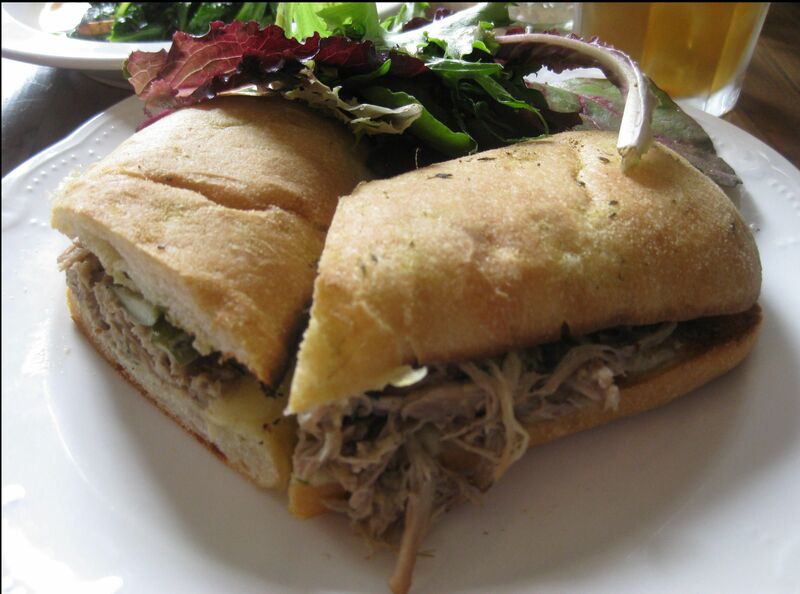 Our second sandwich was slow cooked pulled pork on souman bread, gruyere, pickles and a mustard dressing. Almost a Cuban and very tasty. The bread alone was fabulous. THe pork melt in your mouth tender. THe gruyere and pickles giving it that homey spin with a touch of salty and sour. 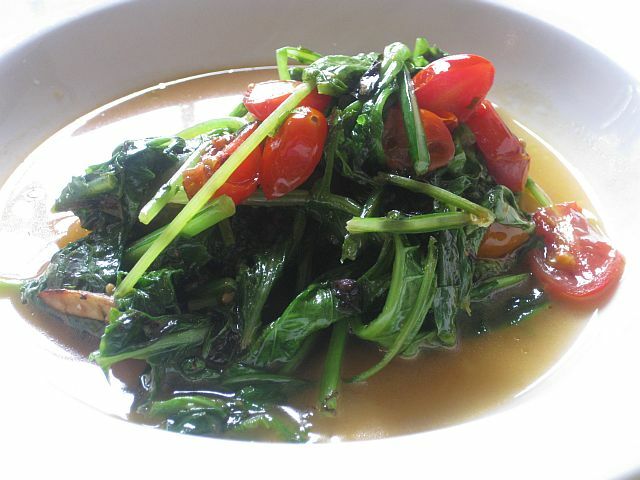 On the side we ordered rapini with roasted tomatoes. Rapini is a cross between broccoli rabe and broccoli. Same shape as a broccoli rabe but not as bitter. This was really delicious. The tomatoes and oil and rapini were GREAT on the mozzarella sandwich! When asked if we wanted anything else, we asked about dessert. The waitress handed us back the menu. The lunch menu. Did she think we wanted another sandwich? When we mentioned that we were looking for something sweet, she said they might have an oatmeal cookie left, but that they don’t serve sweets. Between having to drive around for parking and having to pay for every glass of tea (It’s mostly water, for heaven’s sake), I think I might pass on this one. The meal sounded pretty good, though I’d have missed the dessert.